The Yankees are back in Houston tonight for the first time since losing Game Seven of last year’s ALCS. A crummy end to fantastic season, that was. Even this early in the season, this series does feel like something of a litmus test. The Astros are the defending champs. This series is a chance to see how the Yankees stack up, even though it is only four of 162. That said, let’s not let the ALCS rematch narrative distract from the fact the Yankees have won nine straight games and 12 of their last 14 games. During this 12-2 stretch they lead baseball in runs scored and have allowed the third fewest. Pretty great. Tonight the Yankees are looking to clinch their first ten-game winning streak since June 2012. Beating the ‘Stros would be a swell way to do it. It is cloudy in Houston tonight, but there is no rain in the forecast, so the Minute Maid Park roof might be open. Doesn’t really matter to me. I’ll be watching on television either way. Tonight’s game will begin at 8:10pm ET and you can watch on YES. Enjoy the game. Injury Update: Aaron Judge is fine. Just a day off. He’d started every game this season and played 215 of 248 possible innings in the outfield, so he’s getting a breather in the middle of this 18 games in 18 days stretch. I wouldn’t be surprised to see Gregorius sit tomorrow. He’s started every game and played 234 innings in the field … Brandon Drury (migraines) will not return this series. 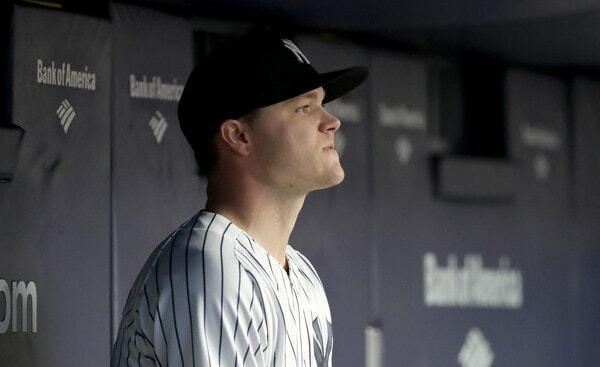 He’s going to continue his rehab assignment with Triple-A Scranton and the Yankees will monitor his progress. Awards! : Congrats to Didi Gregorius. He was named the AL’s Player of the Week. Sir Didi went 10-for-28 (.357) with four homers in seven games last week, one of which was the game-winning homer in the tenth inning against the Angels last Friday. Gregorius is the first Yankee to be named AL Player of the Week since … Aaron Judge in the penultimate week of last season. I get the feeling Didi has an AL Player of the Month award coming his way shortly.